Principal Madhu Bahl is instrumental in furthering the empowerment and growth of teacher-educators of tri-city and of DAV institutions by organizing workshops, seminars and regular orientation programmes based on experimentation, critical reflection and independent inquiry to facilitate mutual learning and perspective. Principal Mrs. Madhu Bahl takes the initiative to host the One-Day CBSE SGAI Orientation Programme in the school campus. Tri-city teachers, counselors and coordinators attend the workshop to gain insight into the effective implementation of the test. The school took the initiative to organize the Student Global Aptitude Index (SGAI) Workshop for the delegate teachers from Northern Zone. Shri R.J. Khanderao, Regional Officer, CBSE, Panchkula, Mrs. Rama Sharma, PRO and Project Incharge, SGAI, CBSE, New Delhi, accompanied by Dr. Chand Trehan and Mrs. Usha Anand, Resource Persons conducted the Orientation Programme, which imparted training and focused on aptitude and decision-making abilities. The Science, Mathematics and Computer Science Faculty of KBDAV-7 participate in ICT in Education for the subjects of Science (Class III to V), Mathematics (Class III to XII) and Computers respectively at Hansraj Public School, Sector 6, Panchkula. Early Childhood Education Workshop for the teachers of Classes Pre-Nursery to II from Tricity DAV Schools, is held at DAV Public School, Sector 8-C, Chandigarh. 18 Pre-School, Kindergarten and Primary School Teachers of KBDAV-7 participated in the 2 Day Workshop. The Hindi, Punjabi and Sports Faculty of KBDAV-7 participate in the Life Skills and Value Education Workshop for the Teachers of Classes VI to X, held at DAV Model School, Sector 15-A, Chandigarh. The Senior and Senior Secondary Science Faculty of KBDAV-7 participates in the activity based teaching in Science Workshop for the Teachers of Classes VI to X, held at DAV Senior Secondary Public School, Sector 8, Panchkula. The Junior and Senior School English Faculty of KBDAV-7 participates in the Teaching of English Language & Communication Workshop for the Teachers of Classes III to X, held at Chaman Lal DAV Senior Secondary Public School, Sector 11, Panchkula. The Art and Craft Faculty of KBDAV-7 participated in the Teaching of Art and Craft Workshop for Classes up to X held at DAV Public Senior Secondary School, Phase 10, Mohali. The Social Studies faculty of the school participated in the Teaching of Social Science Workshop for Classes III to X, held at DAV Senior Secondary School (Lahore), Sector 8-C, Chandigarh. 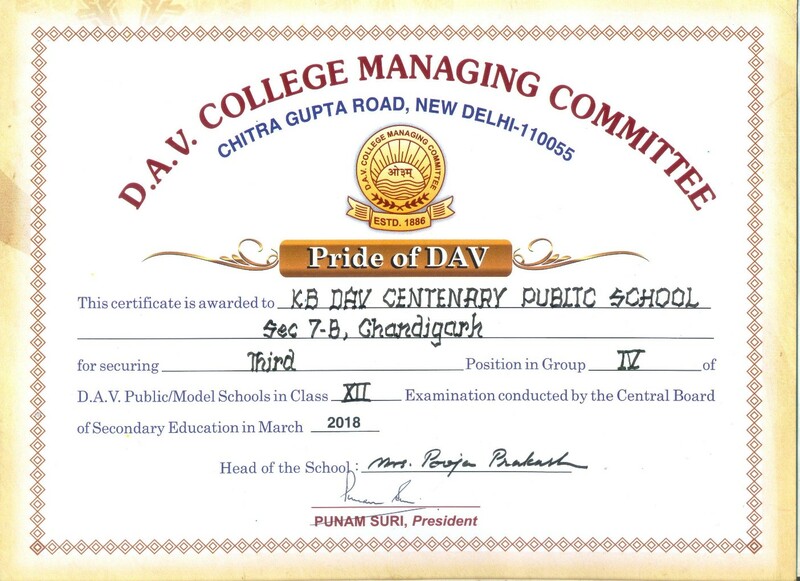 100 English teachers from various DAV institutions across the country participate in the 3-Day National Workshop to develop Sample Question Papers for English Course-A for Class VIII on CCE Pattern at KBDAV-7, Chandigarh. A two day workshop is held at KBDAV-7 for nearly 160 Kindergarten teachers from North India DAV Institutions. Organized by DAV Institute of In-service Education & Research, DAV College Managing Committee, New Delhi, the objective of the workshop is to equip teachers in Early Childhood Care and Education and child-centric education in development aspects. Mrs. Romila Suri and Mrs. Rajni Bala from DAV CMC, New Delhi share their expertise as resource persons. 40 Teachers from local Tri-city Schools attend the “Feedback Workshop” organized by DAV CMC, New Delhi to consolidate their understanding of CCE techniques. Mr. Mantoshpal Singh, Programme Officer, NSS attends the Rashtriya Ekta Shivar held at Rani Durgawati Vishvavidyalaya, Jabalpur as Contingent Leader for Punjab and Chandigarh organized by Youth Programme and Sports Ministry, Govt. of India. Over 15 states participate in the National Integration Camp. A 2-day seminar on Science, Art & Craft and Hindi Language is held in school premises. KBDAV-7 receives Commendation Award at the august hands of Shri Pradeep Mehra, Advisor to UT Administrator at the Award Function for donors of Rotary and Blood Bank Society Resource Centre held at Panjab University, Chandigarh. School teachers Mr. Harminder Singh, Mr. Dinesh Sharma, Mr. Salim Ahmed, Ms. Ritu Sharma and Ms. Jyoti Malhotra receive honors for being regular donors from September 2009 till January 2011. The school features in the list of 25 star institutes involved in voluntary blood donation movement. CBSE assigns special project to KBDAV-7 to prepare question papers for Class IX & X Summative Assessment-II Examination. A team of subject experts from DAV Public School, Surajpur and Chaman Lal DAV Senior Secondary Public School, Panchkula undergo an extensive research to prepare the question papers. 100 English Teachers from DAV Public Schools participate in a brain storming in 3-Day National Workshop to develop Sample Question Papers and Marking Scheme for English Course ‘A’ Class VIII Papers, based on CCE pattern. 90 Enthusiastic staff members from all departments of school attend a 3-day long training session to support regular textbook teaching with Smart Interaction White Boards and Software available for all main subjects. Mr. Surinder Sharma, Mrs. Jagjit Kaur, Mr. Avdesh Kumar, Mrs. Nisha are among the 125 administrative staff members from Punjab, Haryana, Chandigarh and J&K to participate in a one-day Orientation Programme for complete ‘online’ system of correspondence between DAV Public Schools and DAV Public School Administration, DAV College Managing Committee, New Delhi. Nearly 100 Principals of tricity schools attend a one-day Seminar on Smart Classroom Boards and their applications, held at KBDAV-7. 100 Teachers and Principals from entire North India attend a Teacher Training Program on CBSE Students’ Global Aptitude Test (SGAT). Mrs. Rama Sharma, Public Relation Officer, CBSE & Project In-charge of Students’ Global Aptitude Test along with her team from New Delhi conducts the workshop. Mr. S.K. Jena, Education Officer, CBSE, Panchkula. 250 Teachers from Northern India participate in the invocation ‘E-Learning -ICT Integration in School Education in Science and Social Science’ workshop under the aegis of Directorate of Project Planning & In-Service, DAV CMC, New Delhi. Mrs. Rashmi Chari, Assistant Director, DPPI, Mrs. Indermani Jain, Education Officer, DPPI and Mrs. Rajni Bala, Assistant Education Officer, DPPI are among the revered Resource Persons. Peace Club organizes Peace Trainer’s Training Program for Teachers’ In-charge of 100 Peace Clubs of city. Year 2009-10 declared as year for Promotion of Cultural of Peace and Non-Violence. Dr. S.V. Prabhat, IAS, Chairman, Indian Council of Rural Institute, Hyderabad, Gandhian Scholar, Prof. N. Radhakrishnana and Noted Environmentalist Padam Vibhushan Sunderlal Bahuguna were amongst the prominent guests. 50 Peace club incharge teachers from nine different DAV Schools of Amritsar, Malerkotla, Nangal, Derabassi, Ambala, Surajpur, Panchkula, Chandigarh and Mohali participate in 1 day Trainers’ Training Workshop held at school. Principal Madhu Bahl attends 2 days’ Seminar organized by DAV College Managing Committee, New Delhi on the theme “Innovation in Education”. School host 2 days’ Trainers’ Training Programme for teachers of various Peace Clubs of the city. 90 Local school teachers participate in the workshop. Justice Mr. Suryakant Judge, Punjab & Haryana High Court and Mr. S.K. Setia, DPI(S) presides the function. 'The Peace Builders' receive training at the Peace Trainers Workshops. Understanding of World Peace and Relationship on basis of dialogue, peace initiative is stressed.